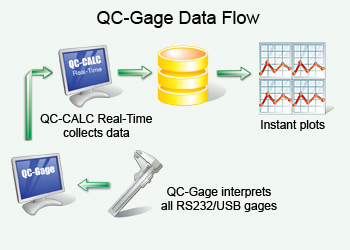 QC-Gage is a full-featured data collection application for use with hand-held gages. The software allows inspectors to enter measurement data by keyboard or through a direct connection to one or more gages. It displays this data both graphically and in table form, and automatically interfaces with QC-CALC Real-Time. By using QC-Gage and QC-CALC Real-Time, you can identify and isolate out-of-conformance parts. QC-Gage simulates the inspection technique of an automated inspection device such as a CMM. You program QC-Gage through a simple wizard by answering questions that describe the sequence your inspectors must follow. These “Spec Plans” are saved and run by your inspectors, leading them in a consistent sequence of inspection. When all data and trace information (serial number, lots, names, etc) is entered, it is sent to QC-CALC where the Real-Time statistics are performed.